Central Florida head coach Donnie Jones was scheduled to give a speech on Monday evening, but when he stepped aside to answer the phone, he knew what was in store. 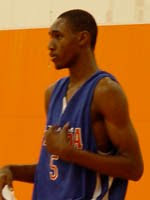 On the other end came the news that rising senior Rod Days was committing to the Knights. “[Jones] excused himself to take the phone call and was very, very happy,” said Adam Ross, Days’ coach at Sagemont (Fla.). Days, a 6-foot-6 small forward, chose UCF over Richmond, Maryland and Alabama. He also reportedly held offers from Arizona State, Boston College, Georgia Tech, Michigan, South Carolina and Wake Forest. Jones has now picked up three commitments for 2011 in the past nine days, getting Virginia transfer Tristan Spurlock last weekend and former VCU commit Kasey Wilson on Sunday. With Oregon transfer Josh Crittle and Illinois transfer Jeff Jordan also scheduled to play after sitting out a season, Jones has already done his job for 2011-12. Throw in the additions of Isaiah Sykes and Jarvis Davis for this season and the return of five players who started at least 14 games as underclassmen a year ago, and UCF is going to be a factor in Conference-USA. Days, a top-125 player with high-major talent, will clearly be a key to the Knights’ renaissance.